I must admit, the first time I saw a chicken harness I did a ‘double take’! Having never seen a hen walking on a leash before, it was surprising to say the least. They are fantastic to use in areas where your chickens can’t free range. You can walk them on the leash to give them exercise; this will help to keep them healthy. So, what exactly is a chicken harness, how do they work and are they a good idea? We hope to answer these questions and a few others in this article and perhaps have a little fun along the way too! Adjustable size to fit variety of chicken breeds. Comes with matching 6 foot leash. What Exactly Is a Chicken Harness? It is a harness that fits over the hen’s head and around and under the wings. If you have a dog (or cat) that wears a walking harness, you know what I’m talking about. It is usually made of a breathable mesh material that is easily washable by hand and air dries. They come with a six foot leash too. They are available in three sizes: bantam, standard and ‘big girl’/ rooster size. Will your Chickens Wear a Harness? That will depend on your hen. Anyone who has tried to medicate a hen knows they have a neck that can pull their head down into the chest – much like a turtle. Apparently, many do the same with the harness and manage to escape! 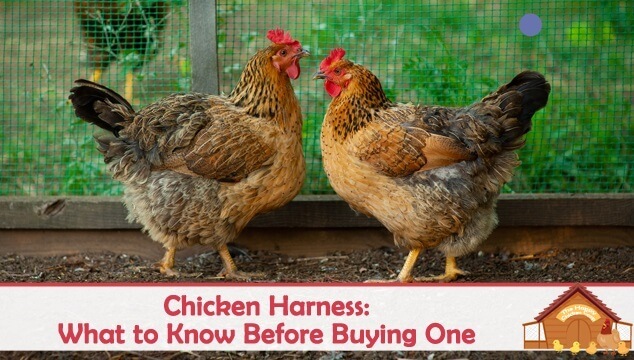 In researching this, it seems that younger hens might do better than older ones at learning to wear the harness, especially if you start slowly. The older girls are more likely to give you ‘the look’ and refuse to co-operate, running screaming from the coop. A couple of places stated that it is easier to train them over a period of time if you can get them used to wearing chicken saddles. The following video shows the ‘how to’ and makes it look very simple – but we all know how deceiving that can be! Chicken saddles are something the hen can wear to prevent the rooster from damaging their feathers and skin while he’s ‘treading’ them. It is better to fit the saddle at night when they are going to roost as they apparently forget they are wearing it by morning. By leaving the saddle in place for a few days, you are setting up the ground work for the harness; at least, that’s the theory! 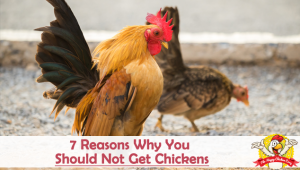 Maybe your hen has a different idea – I know mine do. You should put the harness on during the day but remove at night. There are a couple of clip type fastenings that could get caught up in the coop and you don’t want your hen hanging from the roost overnight. 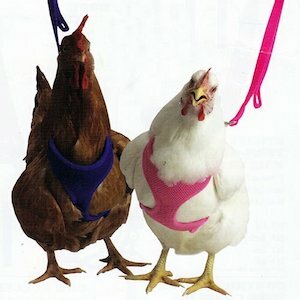 Once she is comfortable wearing the harness, you can attach the leash and try to walk your chicken. Don’t worry about the neighbors staring at you – they already know you as the crazy chicken lady/man in the neighborhood. Is the Harness a Good Thing? It can be. If you live in an area where it is dangerous to let them free range because of predators, it could be a great solution for giving them exercise and allowing them to ‘free range’ for a while. Children seem especially delighted walking the hen, so you could exercise both at the same time! 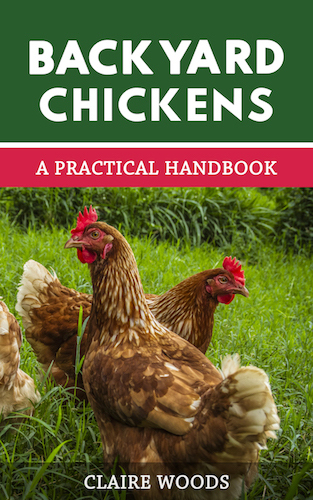 Of course, if you have a large number of hens this would be a monumental task, but if you only have two or three birds it could be of benefit to all. A place where this would be of great use is with therapy chickens. Therapy chickens will often go to nursing homes or assisted living facilities to add some amusement and enjoyment. Also, I’m not sure about Europe and the UK, but here in the US some pet stores allow you to bring your pet in to shop with you, this would be an ideal place for the harness. Having the bird on a harness and leash would give you a great deal of control over the situation. 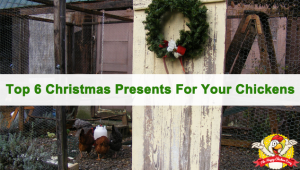 It is also a great idea if you happen to keep a chicken as a personal ‘therapy’ animal. In general there are a couple of things that folks have trouble with. The first problem is putting it on their hens and getting it to fit correctly. If you watch the video above and have a few practices it shouldn’t be a problem. Secondly was the sizing of the harness. Hens that are a bit smaller or larger than the given sizes were easily able to slip out of the harness, not something you want as you are crossing the street. You may need to buy a size up or down to ensure an escape proof fit, not only for the safety of your hen but for your peace of mind too. If you think your hen might benefit from a harness, give it a try. There’s nothing to lose but a few dollars and who knows, the hens and humans might just enjoy it! Certainly you will be the talk of the neighborhood and you will probably be surprised at the number of people that will approach and talk with you about your ‘unusual’ pet. Hello there I was wondering if you could provide some advice re chook nappies please? I’m currently in the middle of writing an article on this and it should be published next month!